Just a fun layout to share today. Lots of layering with die strips and ribbons. It's hard to see in the picture but I put glossy accents on top of the letters to make them look like epoxy. 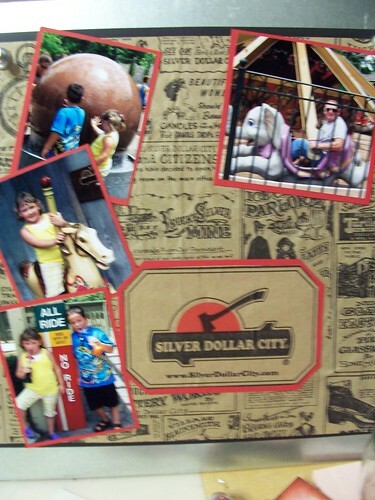 The layout I have to share with you today is from a trip to the Missouri State Fair. Simon and Lizzy had a blast going through the fair. The only thing that had really changed since I was a kid was the cost. Everything is $5+. Luckily we went on the dollar day but it was still pricey. I love the different products I was able to use on this layout. I didn't have to buy anything, it all came from my stash. My Papertrey Ink stamps really finished off the tickets. I also played with layering scraps I had of various patterned papers. I look at the Papertrey Ink Make It Monday religiously every Monday and then usually a couple other times during the week. I plan to make something, doodle layouts while kids are reading or taking tests and often lay supplies out to make the card but never actually get there. When I saw the video this week I actually got busy and was able to make 3 separate cards, each next card is "stepped up" with layering from the previous card. I found this week's video to be especially helpful and fun! 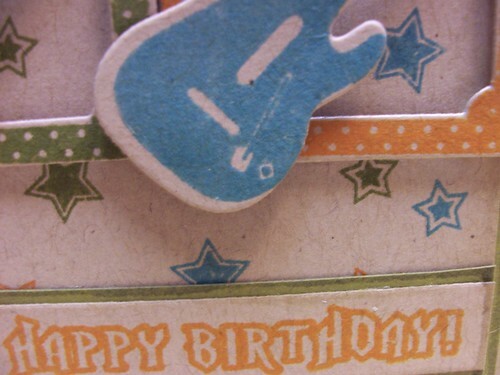 My first card is a single layer card with a little baker's twine. 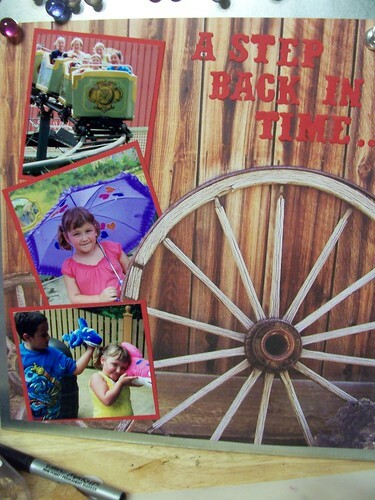 It's a cute card and was a snap to put together. 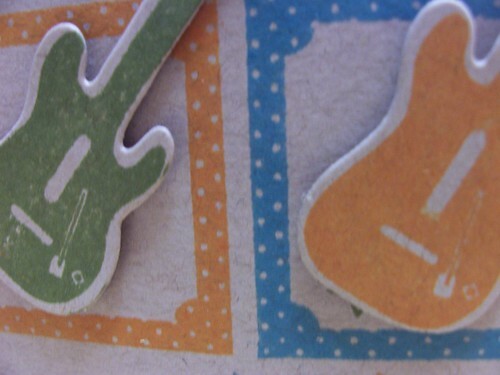 I love the guitar image and the accompanying sentiments are perfect. 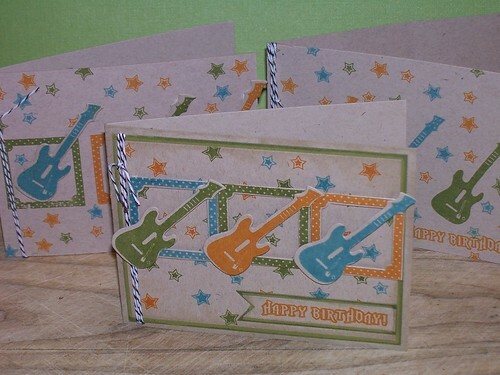 This type of card is quick and easy to put together. 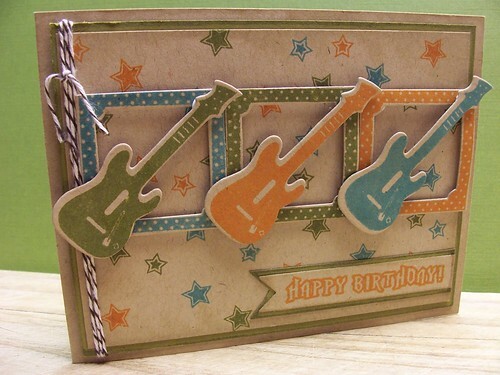 The next card I stepped up a little by die-cutting the guitars and popping them above the coordinating frames. My last card is a big step up. I die cut the guitars, frames and a banner for the sentiment. 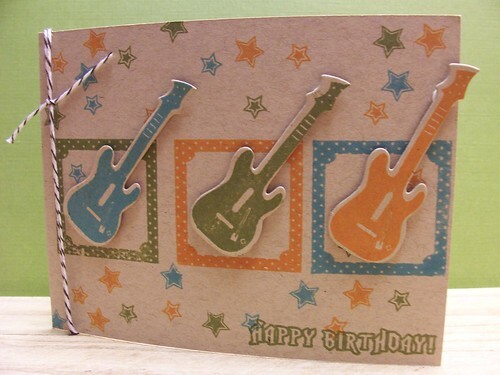 I popped the guitars on top of the frames and then popped the frames on top of the card. I matted the sentiment as well. 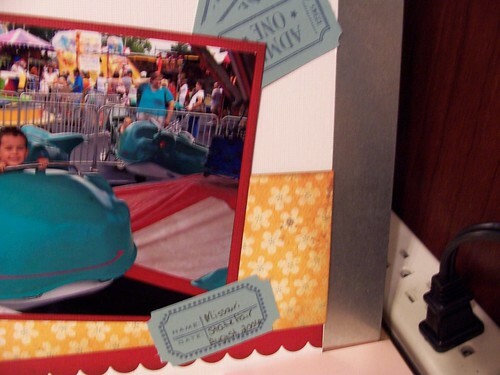 I also added layers to the card by creating a card front with a mat. I inked the edges of all three card layers with chamomile ink. I love the dimension and shadows created with these layers. 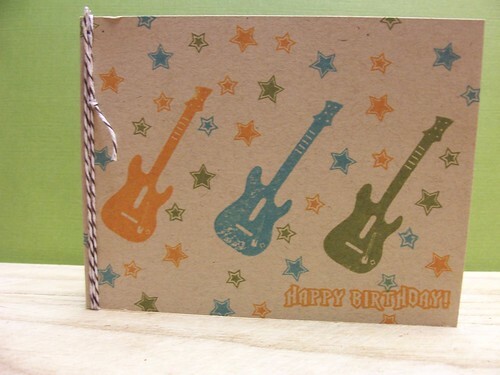 I think I will tuck the final card away for Simon's birthday and the other two I'll save for future birthday needs. All three cards are nice but the last card is definitely "stepped up". 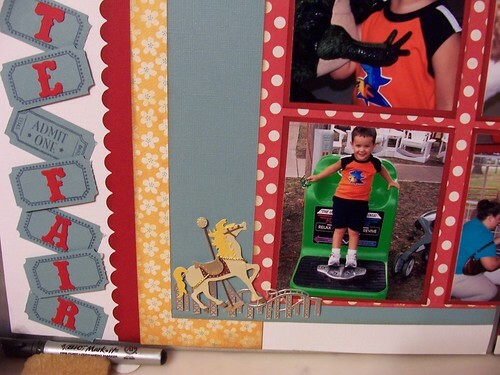 I have another scrapbook Thursday to share with you. 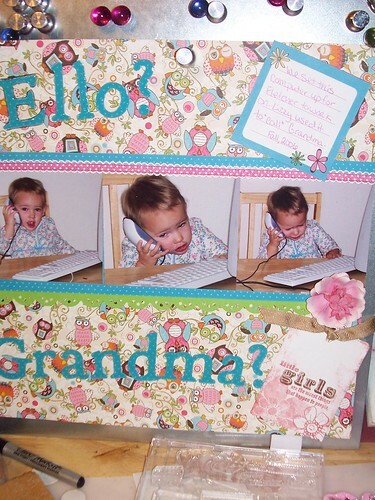 I am not a chronological scrapbooker. 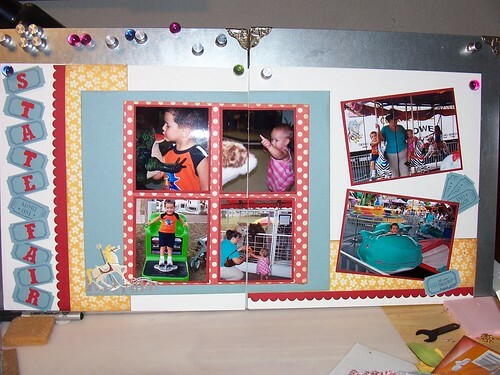 It's a pain when I add the pages to the albums but I also love it because when new baby stuff comes out I get to use it even though I don't have babies anymore. I scrapbook what I feel like working with. I had a blast working with these oldie but goodie pictures from our first family vacation (that wasn't to visit family!). 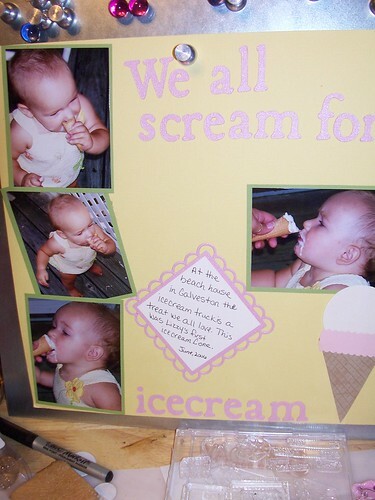 This layout is also 100% cardstock. 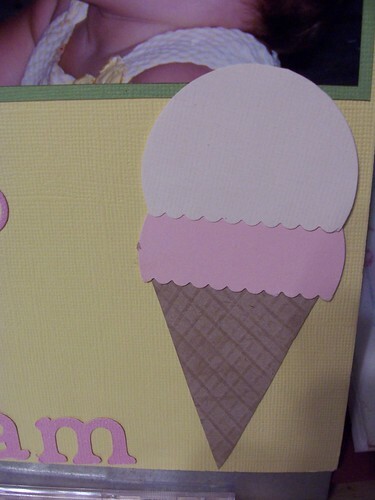 I made the icecream cone with circle dies and my Scor Pal.